There are certain things around our house that just make my eyes smile. 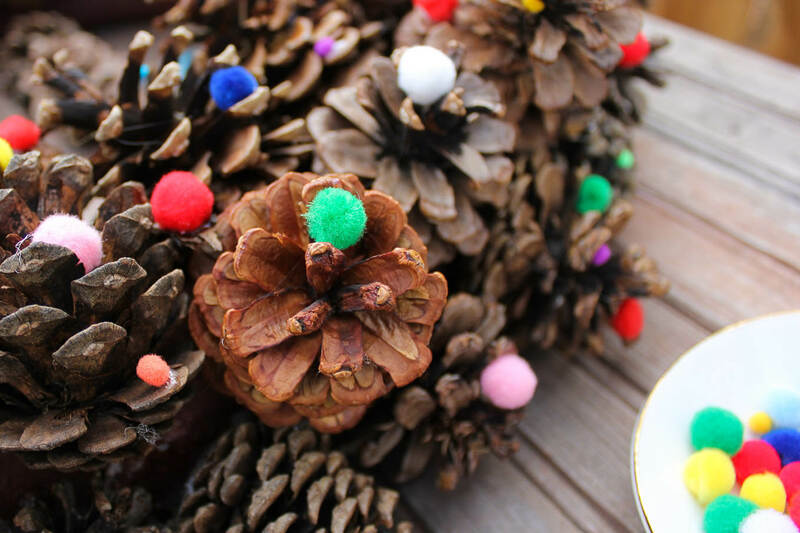 This new DIY pinecone wreath is one of them. And I love how this wreath looks like it could come from a little hobbit’s Etsy shop. 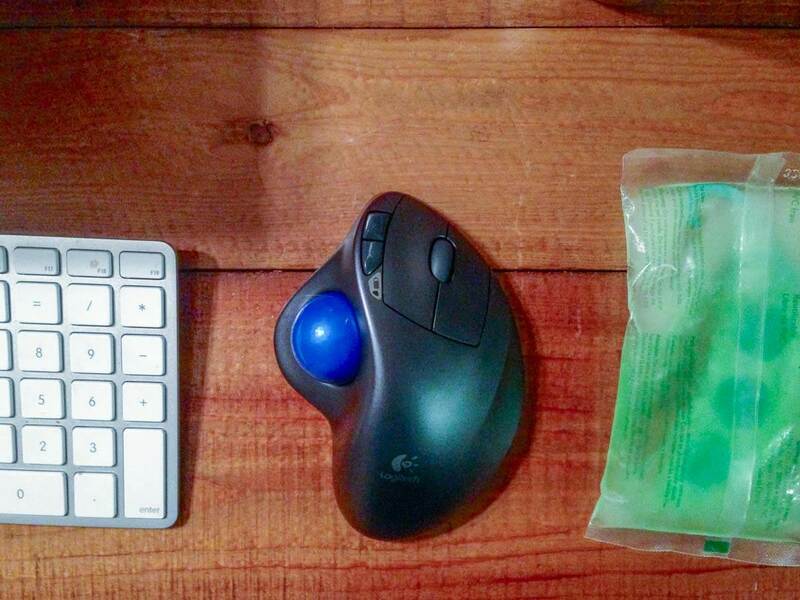 There’s something that feels very magical and woodsy about it. And I woodsy. The pinecones supply a hefty dose of natural texture and serve as a backdrop for the bright, animated pom poms. 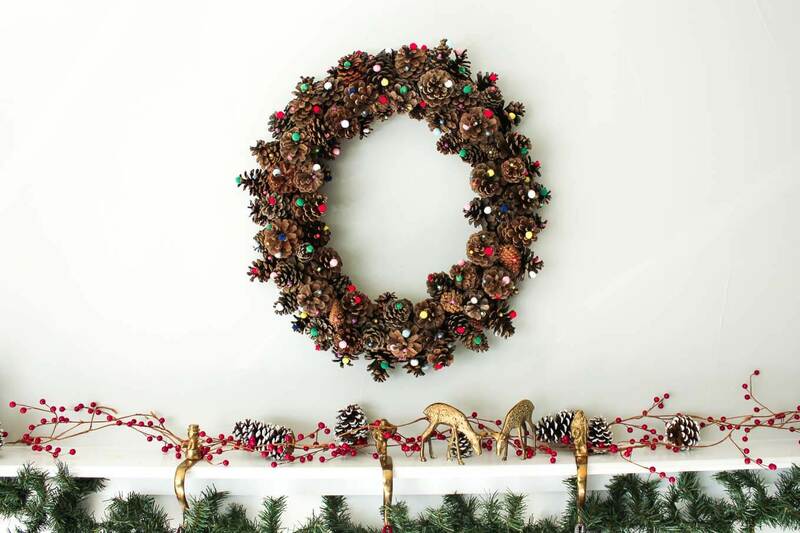 I could see this wreath working with our decor all winter long. It looks Christmassy, but not so much so that we’ll seem lazy if it’s still hanging up come Super Bowl Sunday. Which, let’s be honest, it most certainly will be. 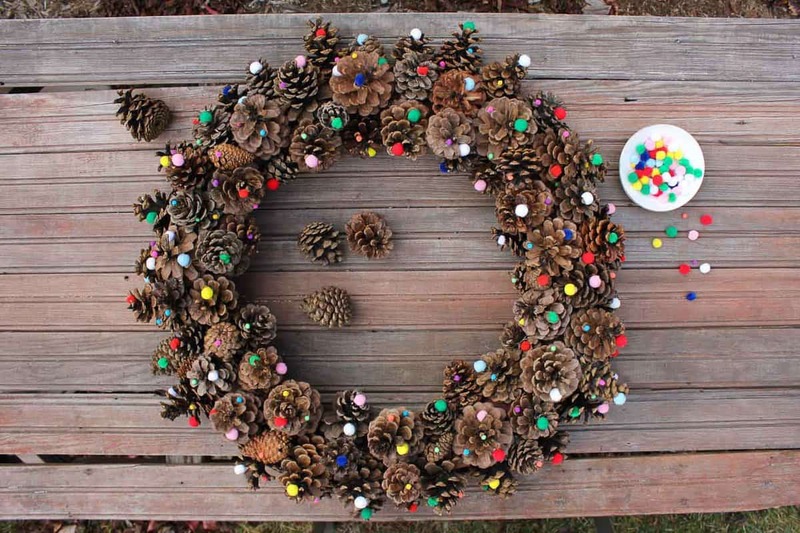 This wreath requires quite a few pinecones, but not nothing outrageous. 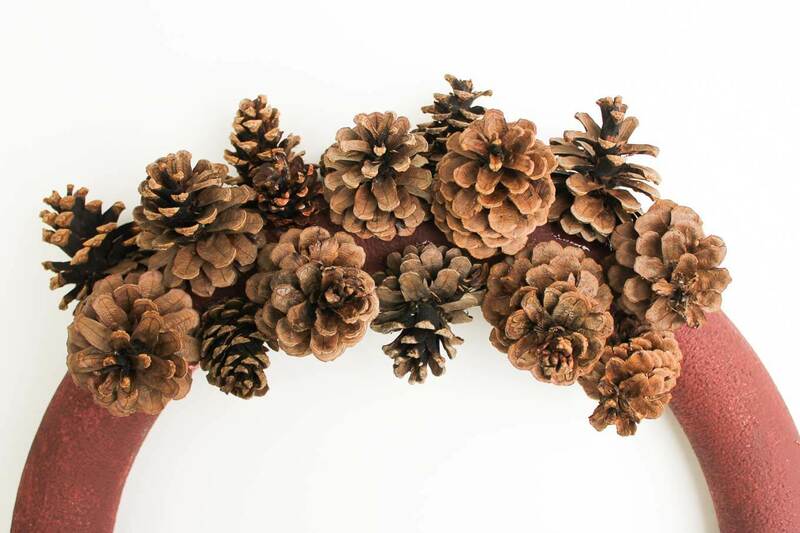 Buy some pinecones or follow my tutorial for cleaning and de-bugging ones you forage for. If you decide to go the hunter-gatherer route, try to collect a variety of sizes of pinecones. You’ll want some small ones to fill in the gaps between the bigger ones. As you’ll see, I used a pool noodle duct taped into a circle for my wreath form. This is generally a great way to save a couple bucks on a wreath form. In this case though, because I made my wreath pretty big, I wish I would have used a legit wreath form. The pool noodle is a little too floppy to support the weight of Mother Earth’s bounty, plus about nine pounds of hot glue. 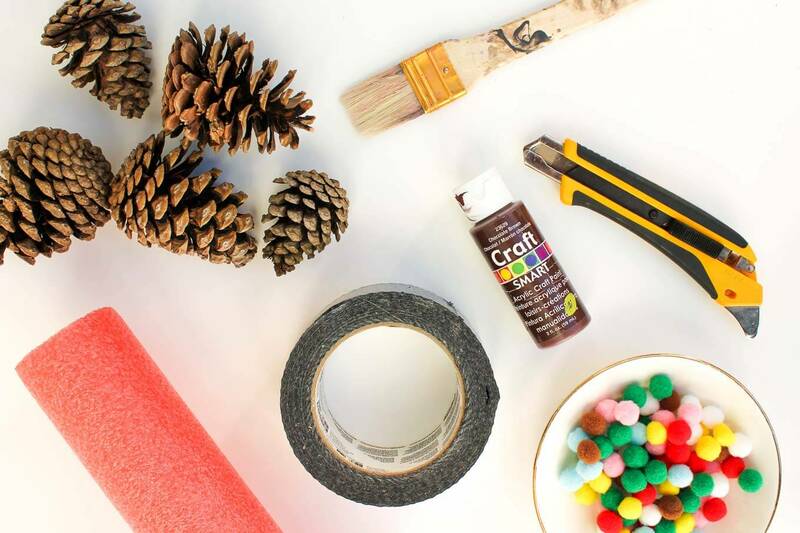 Speaking of which, you’re gonna need quite a bit of hot glue to make this wreath. But, at least around here, it’s not the holidays if there’s not the smell of melting plastic wafting through the house. 1. 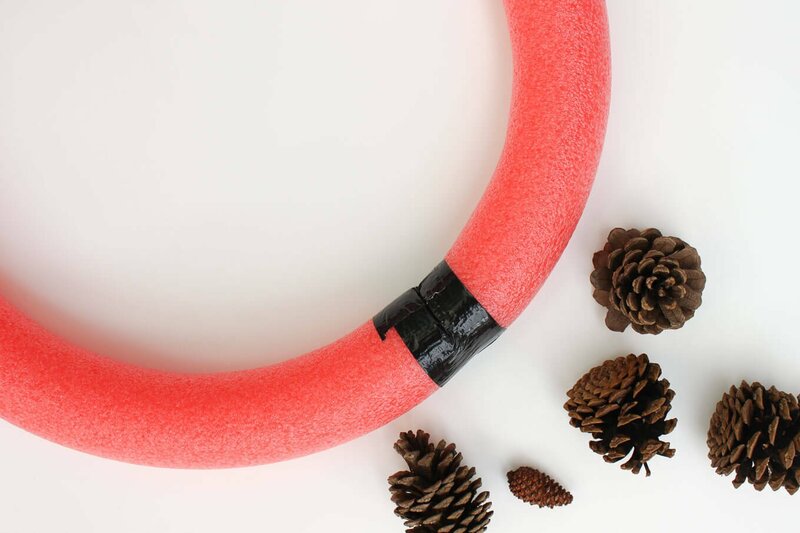 If you’re using a pool noodle for you wreath form, carefully cut it to the size you want and duct tape it into a circle. 2. 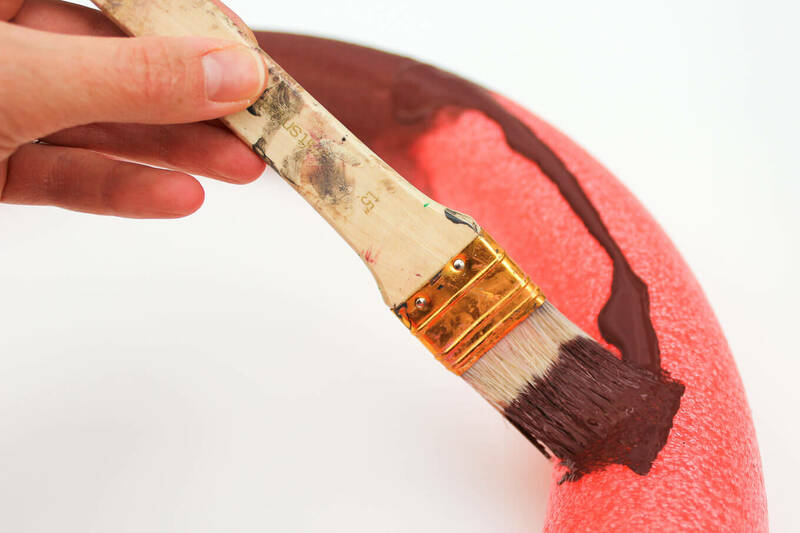 Paint your wreath form brown. You’re not going for Picasso here. It’s just to disguise the parts that peek out between pinecones. 3. 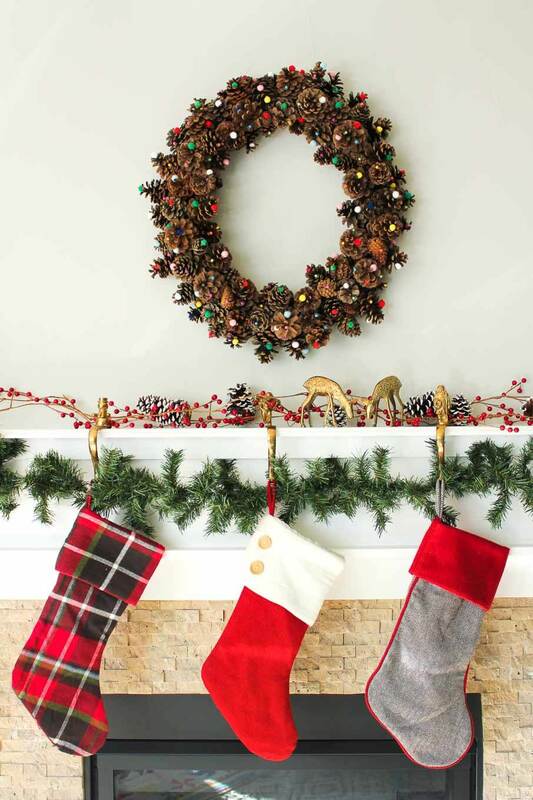 Tie your ribbon in a loop around your wreath form to serve as a hanger. Glue it down in a couple spots. This is easier to do before the pinecones are added. 4. 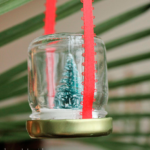 Load up that glue gun and go pinecone crazy. 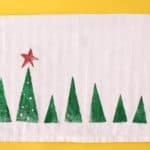 Start with larger pinecones and fill in smaller ones as needed. I chose to glue the bases of the pinecones so that the “petals” would be really visible perches for the pom poms. 5. 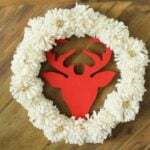 Hot glue pom poms in your desired density around the wreath. 6. Hang that wreath up loud and proud and give your eyes something to smile at! I really love this wreath. It’s so cute. This is great! And I am totally guilty of burning myself every time I try to use the hot glue gun. Suzanna, I’m glad (or not glad??) to hear I’m not the only one. It really doesn’t matter how careful I am, it’s inevitable that I hurt myself with the glue gun.